We lucked out in picking the University of North Carolina’s Rameses as last week’s Monday mascot. The Tar Heels made it to the final game and they will face Michigan State in their almost home court of Ford Field in Detroit Michigan. So, in celebration of the underdog Big 10 making it this far, we will take a look at their mascot, Sparty. Good luck to both the teams tonight as we look forward to getting basketball out of the way in preparation of football. But for now, here’s Sparty. Michigan State, like many other ‘State’ colleges, were first know as the Aggies, dating way back to the 19th century. They expanded their studies so they changed the school name and subsequently the athletic team name. In 1925, the team name came out to be the Michigan Staters. The sports writers didn’t like it so they started calling them the Spartans, thanks to a suggestion from a former athlete of the school. The school president in 1945 commissioned a professor to sculpt a 6,600 pound statue of a Spartan that soon became known as Sparty. The costumed Sparty showed up much later in 1989. 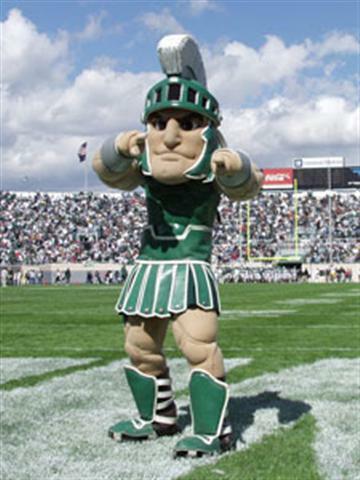 In terms of the mascot costume, Sparty sports the best that mascots have to offer. From the huge cartoony head, the bulging foam muscles, and the tight, shiny armor, Michigan State spared no expense in constructing the perfect mascot. Well, $12, 000 is what they spent. There’s no fearsome growl coming from the massive head, but at least he’s not smiling too goofy. The muscles are huge but apparently are designed to give way to freedom of movement. The armor is straightforward and not to complicated. All in all, Sparty is a clean and sharp looking mascot. Most of the country agrees, too. 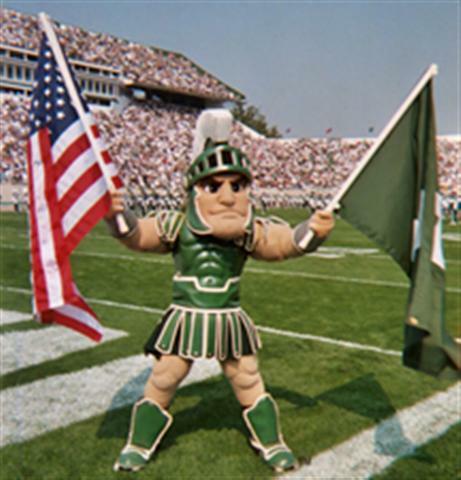 Sparty ranks high among the nation in terms of mascotdom. Even though he hasn’t won the Capital One Mascot of the Year, he has won Universal Cheer Association/Universal Dance Association College Nationals award for Best Mascot, multiple times. Sparty’s been featured on a couple of ESPN commercials as well as appearing in Muscle Magazine and even a Jones Soda flavor. He even showed up on the cover of the Nintendo Wii’s version of EA Sports NCAA College Football ’09, the first time ever a mascot graced the cover. Sparty’s short life as a mascot and all of his awards makes him the Tiger Woods of mascots. Where Sparty ranks with us in the KCCGD mascot ranks is an interesting question. We already looked at a Trojan plus Traveller in USC. Where USC has both a live mascot in the horse and a fully dressed human Trojan, Michigan State’s Sparty is just the foamed branded mascot. Which one is better? Well if you like live mascots and traditions, USC’s Trojans is your thing. 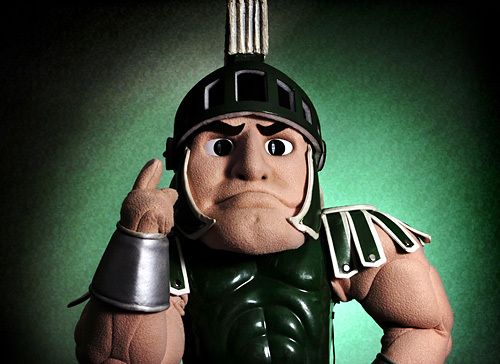 If you like a mascot that you can buy a plush doll too, then Sparty is your guy. Even though USC’s official mascot is Traveller the horse, the traditions the dressed up Trojan does is more impressive than the ultra high tech Sparty. Tonight, however, Sparty is on a national stage with Rameses. 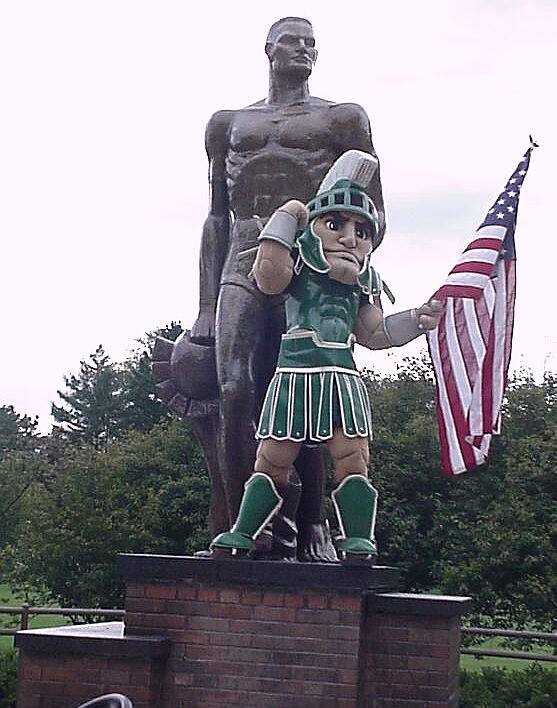 Of those two, we completely go with Sparty. For the basektball game, we really don’t know who will win. Chances are the North Carlonia Tar Heels will come out on top because the beat Michigan State earlier this year by about 35 points. It should be a great game, and we look for Sparty to help keep the spirits up for the Spartans.